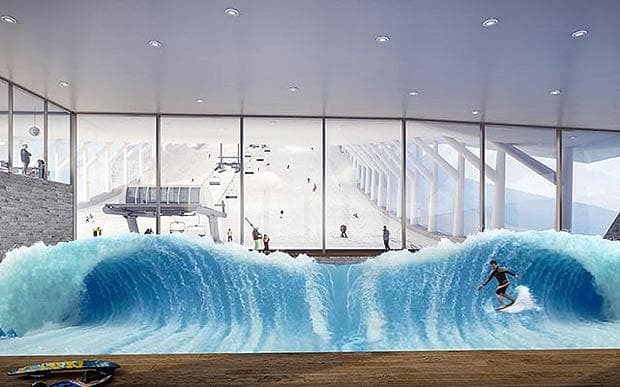 The snow centre will be similar in size to Dubai’s indoor piste and will have its own chairlift, plus a swimming pool, shopping mall and a huge Club Med hotel. With climate change a worry for everyone (except Donald Trump) this project will allow these two weather-dependent sports to be conducted 365 days a year. When completed the Ski Line snow centre will be powered by hydroelectricity from the town’s (currently unused) dam, as well as solar panels and a biomass boiler. During the winter the snow will be real (as it is on a real piste anyway) and in the summer there will be artificial snowmaking facilities for the summer. We think it’s a bold approach and represents a real forward-thinking approach from Tignes as glaciers around the world continue to shrink. The Mayor of Tignes says that the Grande Motte glacier has lost 30% of it’s skiable area so this project will ensure the future of the resort. There is some opposition from Nature groups who believe that the new building ‘does not respect the mountains’, which we can understand. We’re hoping that with all the use of renewable energy though this is a project that can be beneficial to its surroundings and make Tignes even better than it already is.